The Norwegian Ulstein Verft shipyard has now commissioned an offshore construction vessel, the Island Venture, which sets new standards in terms of multi-functionality. SCHOTTEL supplied three powerful SCHOTTEL Combi Drives of type SCD 710 (formerly SCD 3040) in the Rudderpropeller version with an input power of 3,300 kW each. They give the vessel, which is 160 m long, 30 m wide and designed to allow a change in use, increased manoeuvrability for a wide range of different applications. The Island Venture was the product of a European joint venture with building work carried out at two different locations. While the stern was produced at the Crist shipyard in Poland, the bow was built at Ulstein in Norway, where both parts were also assembled. 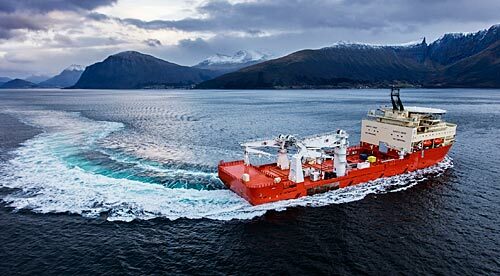 The vessel is designed for operation as an offshore construction vessel with multifunctional applications. Its equipment includes a 400-t crane for deep-sea drilling operations down to a depth of 4,000 m, a 140-t crane with 3,000-m cable capacity and three moon pools. Preparations have already been made to enable a subsequent changeover to passenger and cargo operations, including special measures for use as a module carrier.